Hailing from California, prog rock fusion trio Rcubed gains there name from the first names of the three players. 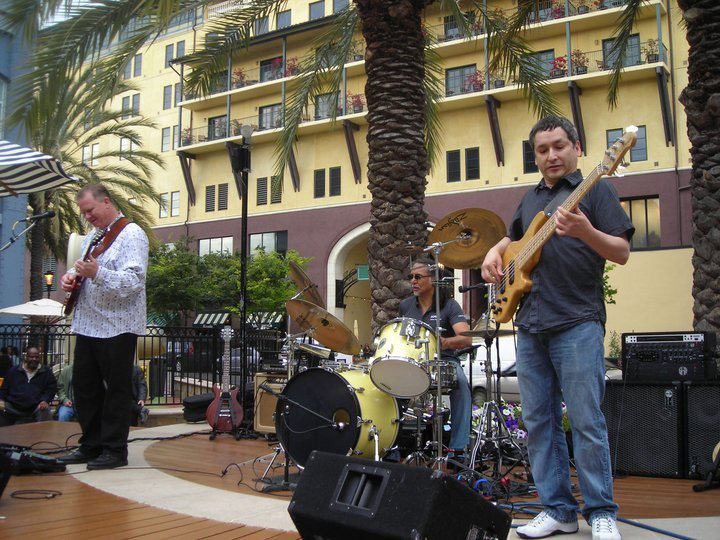 There's Rick Alegria on drums, Ron Sotelo on bass, and Russ Petit on guitar. Together these three men have nearly a hundred years of musical experience in projects both personal and with other players and bands. 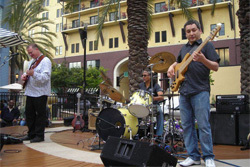 Alegria has quite the musical resume having worked the notables as Bo Diddley, Joan Osborn, Elvis Costello, and singer-songwriter Paul Williams, to name a few. 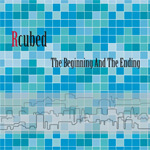 Formed in 2010, The Beginning and the Ending is Rcubed's first full-length album of instrumental progressive rock fusion. A simple spin displays this trio's immense talent, but also their ability to compose and perform together as a cohesive creative unit. As with most rock fusion bands and recordings, instrumental or vocal, the music can range from creative to experimental, awkward to accessible, to simply being the province for other prog rock fusion wonks in which to wander about. All this is the case with Rcubed. But unlike weirder cousins, Rcubed avoids the worst extremes, putting a premium on good playing and interesting arrangements that the average listener can get; that is, if the average listener already enjoys this type of material. At first pass, at least through the first several songs, it's easy to feel that this album is about Petit's versatile and inventive fret board musings. Yet, as with all prog and fusion material, it's the intricacies and nuances for which your ear must listen (and which also makes it so difficult to write about). For instance, Petit is a wizard, quite nimble on his axe as fusion sorcerer, but he's also more a rock guitarist than he may even know. Bullet Train, Spaghetti Western, and Chupacabra are only a few songs that show this essential style. While not necessarily having to start the disc over, you will eventually pick up the skill and verve of both Sotelo's bass and Alegria's drums behind Petit's guitar. Yet, 'behind' is quite unfair to these talented two who, throughout this work, can equally rev up their own tangents and spells of musical wizardry, complimenting and supporting Petit's guitar rhetoric and the breadth and depth of the arrangements. Take note of this on the title track, A Bright New Day, Dark Alley, and Spaghetti Western. For modern progressive rock fusion, in an instrumental format, it's hard to beat both the talent and creativity of Rcubed and The Beginning and the Ending. Even better, Rcubed is adept at blending fusion's sometimes inherent head-scratching complexity with genuine accessibility. It may still be for jazz and rock fusion nerds, but that skill is a rare gift in the field. Easily recommended. Rcubed's The Beginning and the Ending is genuinely creative, surprisingly accessible, album of sophisticated progressive rock fusion from some very talented fellows.